Light: Seeing things clearly. Experiencing intense joy. Celebrating your own successes. Knowing you’re good at what you do. Gaining recognition for your personal genius. Shadow: Being dazzled by your own accomplishments. Becoming absorbed in your own self-image. Feeling rushed and distracted. Exerting yourself to the point of exhaustion. Overstating your abilities or misrepresenting your achievements. Mythical/Spiritual: God the Father. Sun gods, including Ra, Apollo, and Helios. The moment of baptism. Claiming a new faith as your own. Story: At the climax of the story, the main character is victorious. Relationships. You’re turning heads without realizing it. Attention is coming your way—and you deserve it! The admiration of others is a warm glow, so bask in it while you can. As all things begin to revolve around you, take care you don’t get blinded or burned by your own brilliance. Work. With the proper strategy, you’re all set to be the golden boy (or girl). Approval and praise are the order of the day. Accept all this admiration with humbleness; give credit where credit’s due. Meanwhile, make hay while the sun shines. Remember: after noon, the rest of the day is a sunset! Spirituality. As your meditative and spiritual practices hone your sensitivities, you begin to feel your connectedness to the energies around you. Branch out. Spread warmth, love, and joy through your attitudes and actions. Today, embody the universal light. Personal Growth. Learn to win gracefully. Accept compliments with a humble heart. You can acknowledge and celebrate your own achievements without falling prey to greediness. Be who you are. You’ve earned this moment, but don’t let pride in your progress hinder further growth! Fortune Telling. Everything’s coming up roses (or sunflowers, whatever the case may be). Whatever’s on your mind, go for it because you can’t lose today. The sunflowers. Sunflowers turn to follow the path of the sun through the sky, modeling the sort of attention paid to any sunny personality. Their shape and color emulates the object of their attention. Might imitating a respected person be the key to solving your problem? The victor reborn. 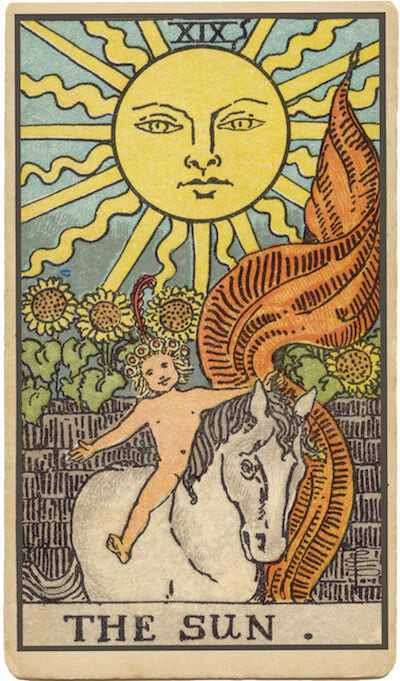 In RWS-influenced decks, the Sun card depicts a single gleeful child. In other decks, we see two dancing cherubs. Both represent an energetic and mystical rebirth. In The Book of Thoth, Crowley writes, “They represent … the next stage which is to be attained by mankind.” In your situation, what needs to evolve? The garden wall. The wall separates citizens of the current world from spiritual purity. From Earth, like sunflowers following the sun, we gaze on this return to Eden with great longing. How does a loss of innocence figure in your challenge? The white horse. RWS-influenced decks place a single child on a white horse, long considered proper conveyance for heroes. When all is said and done, will your actions guarantee you a place on a white steed? The red banner. The banner signifies the RWS child’s victory over animal instincts and worldly influences. Might a spiritual transformation be overdue? How can I take best advantage of the attention coming my way? What are my highest spiritual goals? How can I avoid being bedazzled by the energy swirling around me?